This past week, I've been ill with bronchitis and spent the better part of the week sitting in "my" chair (with the green shawl draped over it). After looking at all the spring/summer themed decor that was still out, it seemed terribly out of place and so I was inspired to get out the fall decorations. It's taken me days to get it out due to low energy levels. 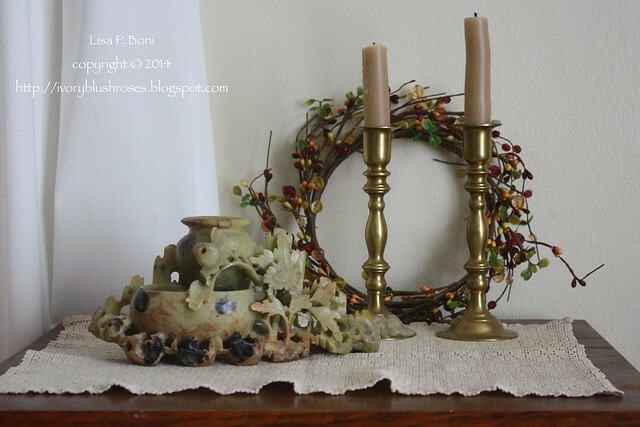 The green and floral garland on the mantel was exchanged for an autumn leaf garland. It is accented with my small collection of squirrel and chipmunk figurines. 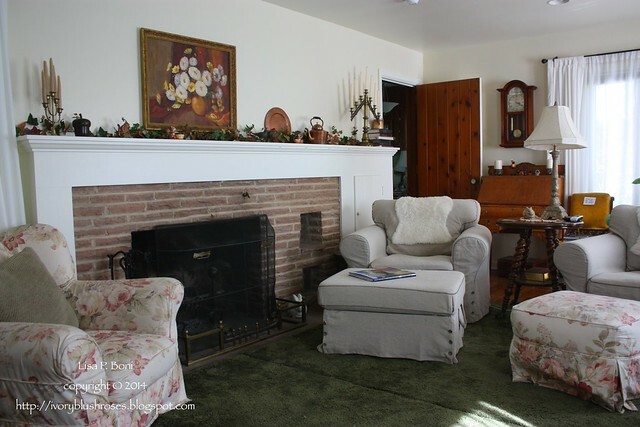 For a focal point, I placed my Grandmother's painting over the mantle. I'm not sure if it was painted by my Aunt Olive or my Grandmother as it is not signed. It hung over my Grandmother's sofa for many years and her living room was all in tones of gold. I love having the painting, which brings lovely memories with it and a seasonal change of color from my usual green and cream theme. 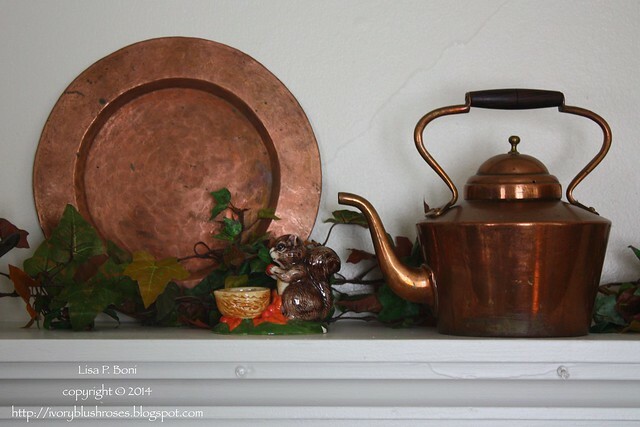 The copper is a perfect accent to the fall decor. The hammered copper plate was made by my adopted Grandma, Florence Scheerer. The copper kettle was my mother's. Lovely warm accents for the autumn season. I'm not a huge fan of Halloween, so I don't put out much Halloween decor. But I do have a very small collection of black cats and of course Mr. Crow, who still makes me smile every time I see him! I also put out a black cat on the front porch railing and when the time comes, I'll carve pumpkins into glowing kitty faces! On the old music cabinet, I put out an old set of bras candlesticks and a piece of carved soapstone that once belonged to my Grandparents and then my Dad. 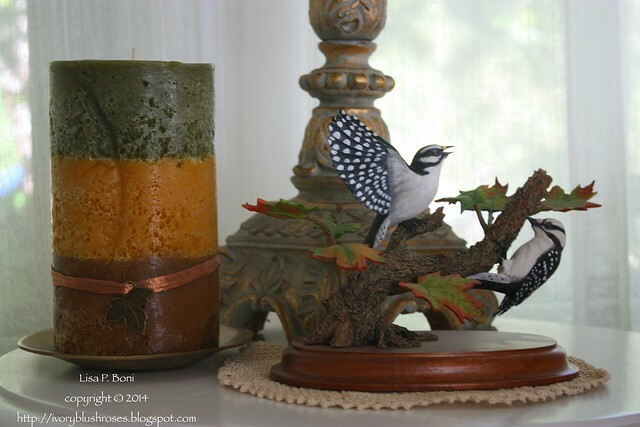 On a side table, I've placed one of my Mom's bird pieces that I kept. So many of my fall decorations bring lovely family remembrances. 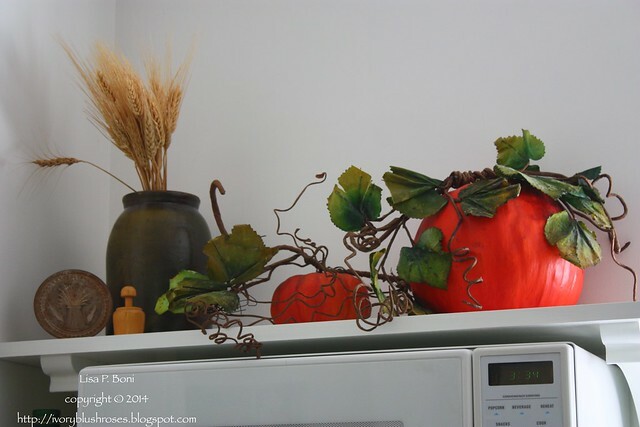 In the kitchen, the shelf over the microwave got a s seasonal update with a stoneware jar, a couple of carved wooden butter molds and a couple of my Mom's faux pumpkins. I hope to do more to the main shelves in the kitchen but haven't had the energy for that just yet. 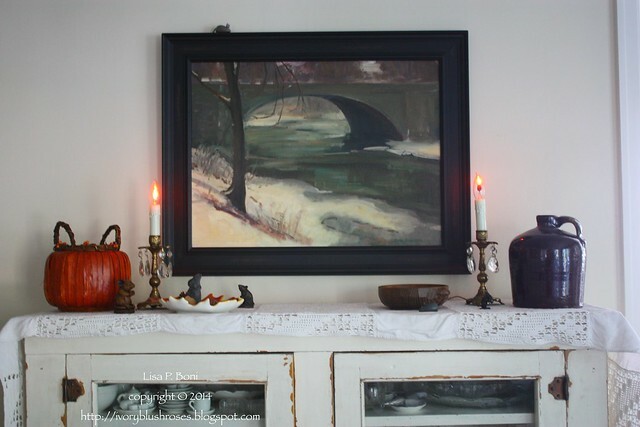 Over the china cabinet in the dining room, I changed the spring themed painting out for a fall/wintry one. This one by my Mom. It's one that won ribbons in an art show. I put out some of my mouse collection here as well. 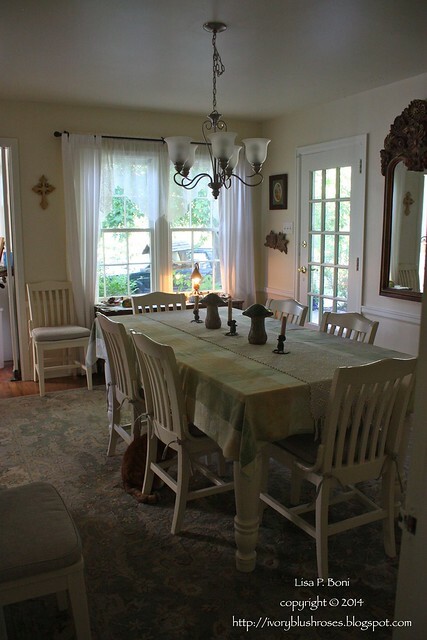 A wider shot of the dining room in its autumn decor. It's much simpler than last year. I found that wall of paintings to be very overwhelming in my little house after a while, so went for clean and simple this year. And looking from the opposite corner out. This has to be one of my very favorite rooms in this house. I only wish that our varied work schedules allowed all the family to gather around the big table a little more often. 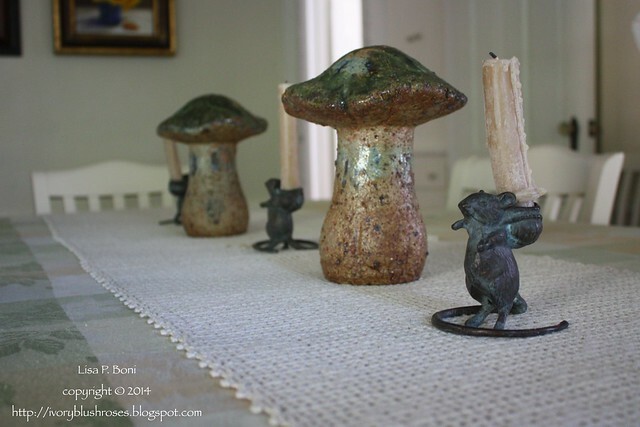 On the table, I've used some pottery mushrooms I found a couple of years ago along with some sweet mouse candle holder that my sister got for me one year! I've always loved mice and at one time, had quite a large collection of mouse figurines and other items with mice on them. I even raised mice for a long time, and sold them to a local pet shop who loved them as they were all hand tamed and so made great pets as they didn't bite! 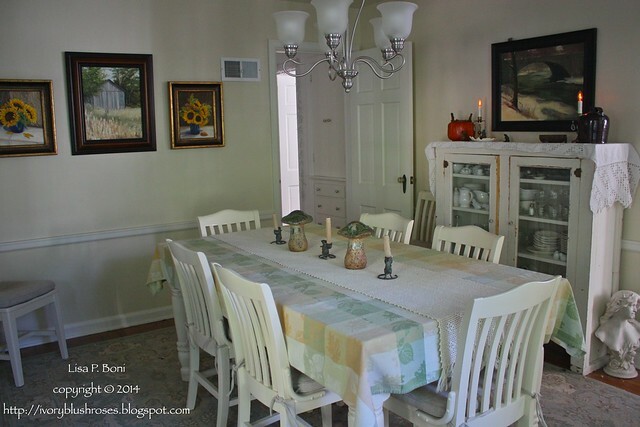 On the dining room wall, I changed the paintings to a trio of autumn themed paintings that I did several years ago. I keep thinking I'm going to sell the sunflower paintings since they are in colors that I just don't use in my home, but then I end up bringing them out and using them at this time of year and am so glad that I've kept them! As the season changes, and I am weary and not feeling well, to read Isaiah 40, where these words originate, brings such encouragement and one of my favorite sections of scripture. I've been following your blog for a long time now and I just love it. However, today I just had to comment. The scripture you've used is one of my favorites also and it prompted me to reach out and say Hello. Dear Lisa ~ I am so sorry to hear you've been sick, and pray that you will soon be feeling back to normal. 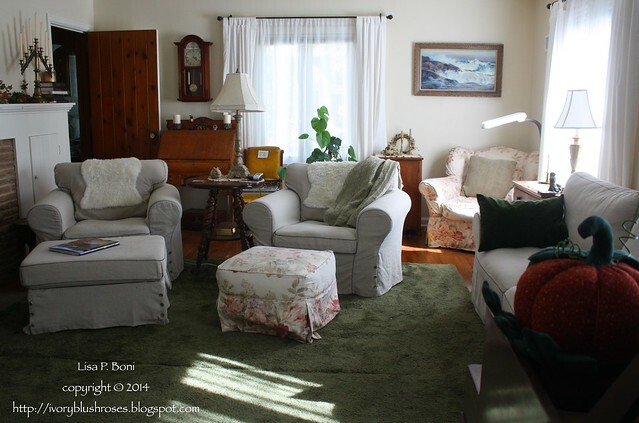 Your home is lovely and filled with so many memories, via paintings and other bits. Your family is quite artistic, going from one generation to the next. Have a great week and happy Fall. I loved the scripture included in this post too. I do like your house. It's one of those that I could just move right in and be comfortable without changing a thing. 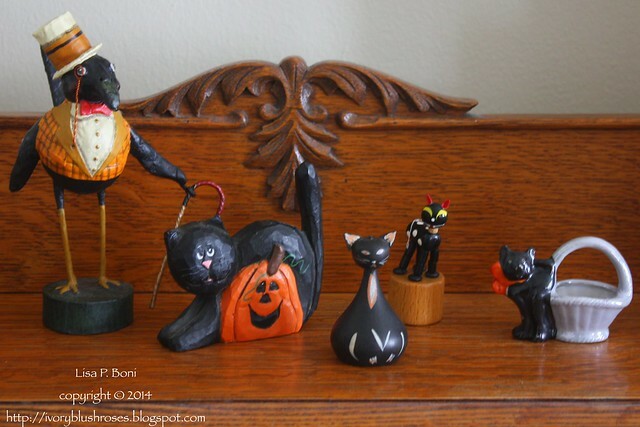 Your autumn decorations are lovely and might inspire me to go get my own box of fall out of the attic.